Casement windows are very popular choice for any room in the house. All our casement windows are coming with the 3 1/4-inch welded frame and welded sash. For all casements we use a triple seal for maximum energy efficiency and multi point heavy-duty Truth hardware for easy use and safety. A 93 degrees crank out sash gives you lots of air flow and makes it easy to clean from inside of the house. Full internal screens are spring loaded for the ease of operation.7/8 thermo glass with the INEX spacer. 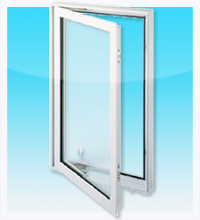 Casement window is a traditional favourite and elegant window.